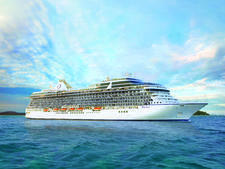 The brainchild of cruise industry veterans Frank Del Rio and Joe Watters -- former heads of Renaissance Cruises and Crystal Cruises, respectively -- Miami-based Oceania Cruises emphasizes a destination-intensive floating-hotel experience with top-notch food and superior service. Overall, the line is known for its culinary program and foodie shore excursions, as well as luxury-level service, just with fewer inclusions in its base fares than the classic luxury lines. In 2007, Oceania was acquired by New York-based Apollo Management, L.P., an investment company that specializes in private equity, debt and capital markets. Quickly following the acquisition, the line placed orders with Italy's Fincantieri shipyard for its first new-builds -- the aforementioned Marina and Riviera. 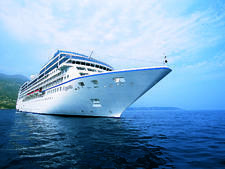 While owned by Apollo, the line was managed by Prestige Cruises International, along with luxury sibling Regent Seven Seas. 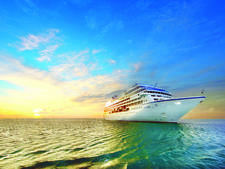 In 2014, Norwegian acquired Prestige Cruises International from Apollo Management. Oceania and Regent joined into the larger company, the publicly traded corporation Norwegian Cruise Line Holdings Ltd. Del Rio is now the larger corporation's chief executive officer and president. The big differences between Oceania's classes of ships are the size and resultant number of amenities. Extra restaurants, a Wine Spectator La Reserve Wine Bar and The Culinary Center are only available on the newer, larger ships (although as mentioned, Sirena does have a Red Ginger). Although they're smaller, Regatta, Insignia, Sirena and Nautica have a cozier ambience. In all cases, Oceania decor is traditional luxe, with the requisite polished dark mahoganies, muted fabrics and rich-colored carpets. By virtue of the ships' sizes, it's not difficult to find yourself oriented by the first day at sea. (Even the much larger Marina and Riviera are a cinch to navigate, though you can expect a more colorful, modern palette.) These ships bear a high ratio of standard balcony cabins. Service is enthusiastic and gracious, courtesy of the well-trained staff. The dress code is country club casual, intended to partner perfectly with the line's "whatever you want, whenever you want" mindset. Oceania neither encourages nor discourages children onboard. However, no children's programs are in place, and there is little else to keep boredom at bay, apart from customary table tennis, shuffleboard and Monopoly in the game room. What all ships also share is an all open-seating dining policy and a variety of restaurants and lounges onboard. There are five restaurants each aboard Regatta, Insignia and Nautica. In addition to the traditional main dining room (albeit with no set tables or seating times), the ships have Waves Grill as well as three additional restaurants (The Polo Grill for steaks, Toscana for Italian and The Terrace Cafe, the buffet that has upscale choices like lobster, steak and lamb chops), which do not levy additional charges. Although Sirena is the same size as the other R ships, it has five restaurants beyond the main dining room: Waves, Terrace Cafe, Jacques Bistro (lunch only), Red Ginger and Tuscan Steak. Riviera and Marina have additional options, from the Asian Red Ginger and French Jacques Pepin to the La Reserve wine-tasting menu. All spas are operated by Canyon Ranch, the noted American destination spa company, and offer premium services. The thalassotherapy whirlpool on the three smaller ships is complimentary with the purchase of a spa treatment. (The same applies to similar pools on the forward deck on Marina and Riviera's facilities; on Sirena, the pool is part of the suite class perks.) The fitness center offers Pilates and yoga, along with the usual aerobics classes. Casinos are small, but there are plenty of slot machines. Elaborate afternoon tea is served daily. Passengers tend to be older (50+) and well traveled, hailing mostly from the U.S. and Canada. The line also markets to English-speaking travelers from the U.K., Ireland, South Africa, Australia and New Zealand. Oceania has a fleet of six ships, all in the midsize range. Four of the ships are considered "R-class ships," meaning that they originated with the defunct Renaissance Cruises and two of the ships are new-builds created especially for the line. 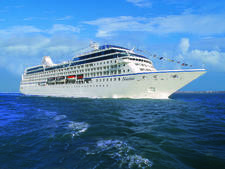 With a 684-passenger occupancy, Regatta and Insignia are the fleet's original ships. Sister ship Nautica joined the fleet in 2005. In 2014, the company spent more than $50 million to refurbish these late-1990s vessels, and it shows. Public rooms, including restaurants, are graceful and elegant. The redone pool area is surfaced in teak and framed by gorgeous mosaics, and it boasts teak furnishings that include fabulous double sunbeds. Cabins have been tweaked and feature more comfortable bed linens and some of the most comfortable mattresses at sea. In February 2011, the line's first new-build, the 1,258-passenger Marina, was christened, and a nearly identical sibling, Riviera, debuted in May 2012. Holding myriad original artworks, as well as The Culinary Center and mega-chef Jacques Pepin's first namesake restaurant, the vessels set an even higher standard for the line. 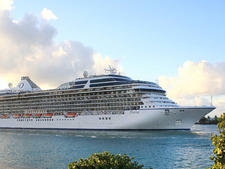 Rounding out the fleet is Sirena, another R-class ship that was acquired from Princess Cruises. Launched in 2016, Sirena is almost identical to its siblings, with key attributes being its small size and ability to offer itineraries in both marquee and out-of-the-way ports. A few key differences include completely re-decorated suites and the addition of Red Ginger; Sirena is the only R-class ship to have the popular Asian restaurant, which debuted on Marina and Riviera.